To: anyone interested in the Logitech Z5500 thx system. After making the POZ I system, I was satisfied with the sound, but thought I could possibly improve the sound, by extending the upper ranges and slim down the profile of the unit and make it easier to store for transport. I also wanted to improve on the overall ability to play to larger audiences and improve the monitoring while playing by adding a monitor feature. I was somewhat reluctant to abandon the pre-made enclosures for the satellite speakers, which I assumed were calculated to size and cubic air space, but thought what the heck I'll try it. I upped the speaker size and magnet size on the 4 speakers to 4" 8 ohm instead of the 4 - 2.5" 8 ohm in the logitech, plus the magnet size is probably increased by 30% on each. The midrange speakers are the same as the POZ I. I used 2 - 8 ohm Cervin Vega 6" with the Boston crossover and substituted (did away with) the 1" tweeter" and went to a external jack for a extension speaker, (using a center speaker from the Logitech ( 1 - 2.5" 8 ohm) with a custom made mounting bracket that fits the Tyros 1-2-3" ). Click on any photo to open a larger view. Some techie stuff . . .
Tolex covered case 8.5" wide X 5.5" deep X 45" high with nickel plated corner guards. Total height from floor (this includes sub base, mounting bracket and speakers exactly 60" (5 feet). Weight of the sub (with oak mounting unit with spring loaded handle is about 33 lb. 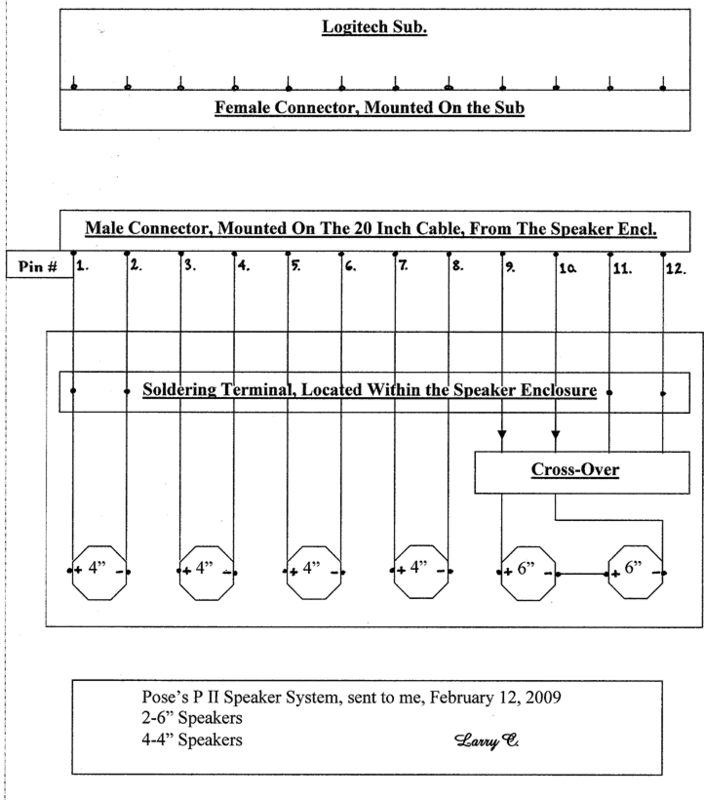 Weight of the speaker cab is very close to the same. Both units are balanced on the handles, which makes it easy to carry both units at once. There is no way to demo this to a reader or a listener, you have to be standing in front of it. I "guarantee it will blow your sock's off " listening to this stereo X 2 rig that puts the sound in every nook and cranny, and at the same time being able to get your ear close to the speakers or out in the audience and not hearing much of a volume change, is amazing and completely different from the old amp/speakers systems. I have not tried this unit out yet, just completed testing this morning, but I am guessing it will have no problem doing an outside gig for at least 200-250 people. Seniors probably 500 or more. (I can't run it up past idle in my studio of 14' X 24' ) but cranked to all I can take, no breaking down of sound quality.